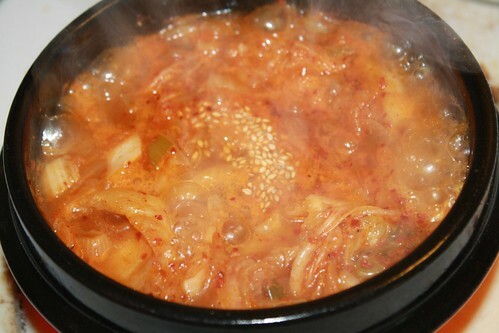 Trust me, you’re gonna love this…Kenny’s mom dropped off a big pot of kimchi jigae! Sorry, I couldn’t resist. I love that scene! Seriously, what says Korean home cookin’ more than kimchi jigae? It’s incredibly easy to make and so yummy especially when it’s cold outside. Heat the oil and stir fry the kimchi over medium heat, till cooked through (usually around 7-10 minutes – the more bitter the kimchi is, the less time you will need to cook). Add the water (to cover the kimchi, but not too much) and bring to a brisk boil. Turn down the heat to medium, add the kelp powder and pepper powder and boil until the broth thickens (usually around 10 minutes). Don’t forget that you can also add some tofu slices/cubes at the end if you want some protein in there. Add the sesame seeds and serve with rice. 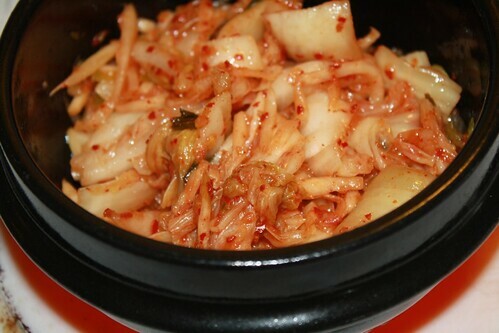 Keep in mind that the bitterness of old kimchi can be quite a plus when making kimchi jigae. ← Korean Grocery Stores in Indiana! No way! This is way too good to be this easy!!!!! Too many “!”, sorry. I added dried seaweed and put this over brown rice and barley. Oh, man. This is almost as good as my friend’s oma’s. 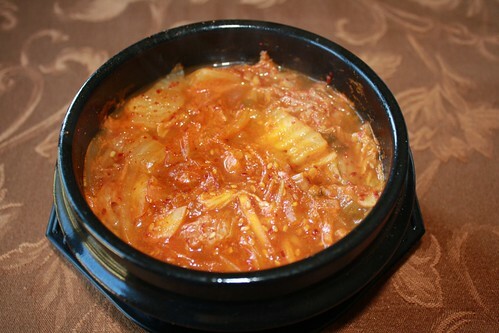 Her Kimchi Jigae obviously wasn’t vegan, but this really takes me back to the old days. Thanks! Hi again! How do you describe vegan kelp powder to a Korean market person? Usually the kelp stuff I’ve seen has fish products in it… what kind of 김가루 is it? Thanks!! I’d say you need ask for powdered Kombu or kelp. Probably call it 다시다 가루. You might be able to try blending sheets of Kombu or kelp yourself. We get our organic kelp powder at Whole foods! They keep them in the bulk spices area in jars. Let us know if you have any other questions! I made this for lunch today. Amazing. First time I’ve had it without pork or beef – and I used veggie broth instead of water. Definite yum! Awesome, thanks for letting us know, Dana. Are you a new vegan or just experimenting? Loved this recipe -so simple and so delicious! Added zucchini, thin sliced carrots and used veggie broth. Thanks! Yes, veggie broth is a good addition if you have any handy! I am trying this out right now! It looks and smells awesome, I can hardly wait for my rice cooker to finish doing its thing so I can try it. Love Korean food, but always have to look out for the fishies.I’m so glad to find a site that has vegan Korean recipes. Awesome, hope you enjoyed it. You do have to look out for the fishies (poor fishies)! Thanks Nereyda! Hope you enjoy all the recipes and kudos on making your own kimchi! Awesome! Hope it turns out well for you!